Click here for up to the minute updates on King Diamond’s campaign for President. Will he run or not???? The King has summoned President Obama and House Speaker John Boehner to a meeting at his hidden lair located somewhere in the Alps. The King’s Lair has only been seen by a handful of people and has never been photographed. There have been rumors over the years that he has the world’s last remaining minotaur in a pit in his backyard. According to The King the meeting, set for Tuesday afternoon, should straighten everything out. “If I was able to put my differences with Mercyful Fate aside in order to reunite and make great music back in the 90’s, these humans can certainly put aside their petty differences,” said the King in a scornful, frustrated voice. This entry was posted on July 22, 2011, 9:23 PM and is filed under General Weirdness, King Diamond For President in 2012, The Politics Of Catastrophe. You can follow any responses to this entry through RSS 2.0. You can leave a response, or trackback from your own site. Would I be considered unpatriotic if I said I preferred to see the bag of skulls Wednesday morning? I love the hipster tax, but please leave Spam out of it. Spam is a noble product, the most American of canned foods, a veteran of many wars including WW2, and a true social icon. Spam already has to suffer with the indignity of having junk Email named after it – taxing T-shirts and other paraphernalia trumpeting the triumphs of this tasty treat would tear its’ tradition to tatters and terrorise the totters of its’ triumphs. Enough I say (in more ways than one)! Spam is fine, but hipsters wearing Spam shirts are simply not okay. We didn’t fight 2 major wars and deal with 12 seasons of MASH so that these kids can run around being ironic all day. 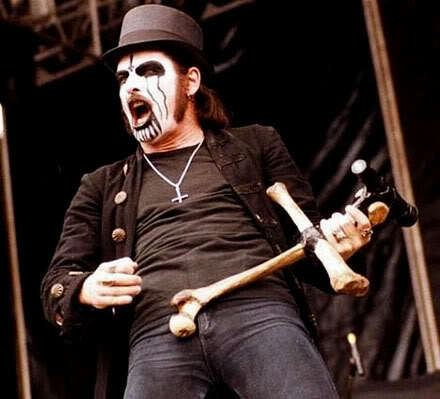 i’m glad that king diamond has stepped in. hes a grate singer and a good man. these stupid repukelicans and dumbocrats can’t get anything done. maybe king diamond can bring america together. This is dumb. How is he going to make enough money off of hipsters to end the debt? 3.8 trillion dollars is a lot of money. I don’t think his math is right. Its time for this guy to get out of the way and let the politicians do there jobs. Thrash till drath’s skull will be included also. 536 skulls in a bag! I like it. This is so stoopid!!!! King Dimond should stick to making his awesom music and merciful fate and not getting involved in american politcals.What does this dude know about debts and tax? Stick to what you no King!! No body cares about hearing your views! Now more musick ok? You realize this is fake, right? No its not! Its on the internet!!!! HA! Everything on the internet is true!!! EVERYTHING!!! !